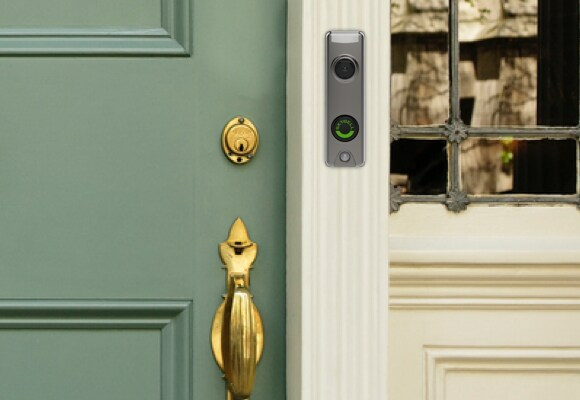 With a 180° view, 5x zoom and color night vision, you’ll easily be able to see who’s at your door, any time of day. Speak to your visitors in real-time through your Skybell Video Doorbell using the ADT Control® app on your smartphone or tablet. The built-in motion sensor detects someone at your door and sends you an alert so you can see who’s there. Nearly 34% of burglars enter a home through the front door. 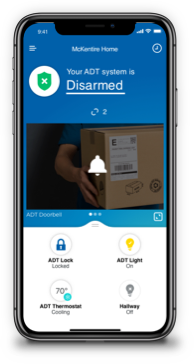 * The Skybell Video Doorbell can help deter them from breaking in. If someone is on your property and triggers the motion sensor, you’ll get an alert. This lets you know someone is approaching. And, with clear, high-definition video, you can tell if your visitor is a welcome one. It works whether or not your home already has a doorbell; plus you can install it yourself. Weather- and rain-proof, it works in temperatures as cold as -40°F and as hot as 140°F. See what’s happening around your home with the 180° diagonal viewing angle. Syncs with your system via a built-in 802.11 b/g/n Wi-Fi connection. Full-color night-vision technology means you can see visitors in the dark. 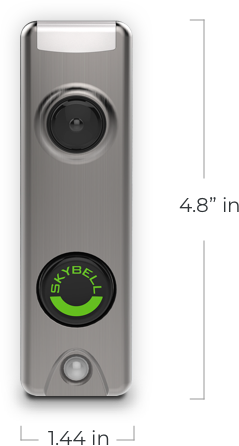 The Skybell Video Doorbell is compatible with Apple iOS 8.1 or higher and Android 2.X or higher.